UK, 1981, 90 minutes, Colour. The Appointment is a little seen British thriller. It has interesting aspects - but they don't seem to come together to make a satisfying whole. There are suggestions of the occult as a young girl disappears in the woods in England. Three years later there are repetitions of these themes with another young musician and her dealings with some diabolical hounds. There is also a focus on the musicians father and mother and their dreams which come to devastating fulfilment. While the ingredients are integrating, there not clearly written and at times the film slows down and seems extraordinarily protracted. However, there is quite a finale dealing with a car crash, a car held in the top of trees until it finally plunges. This definitely draw audience attention. 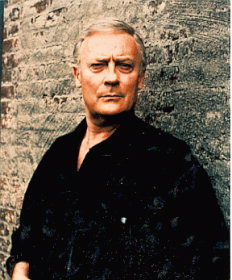 The film has a strong leading man in Edward Woodward who gives the film more strength probably than it deserves. Jane Merrow appears as his wife. An odd thriller. 1. Interesting and entertaining thriller? Suggestions of the occult? Dreams? Violence? 2. English settings, the town and the woods, the scenery of north Wales and the cliffs? Stunts and special effects? Musical Score? 3. The title - whose appointment? The appointment with death? 4. The opening, the three years earlier, the girl, her walk, the mysterious noises and voices, her disappearance in the woods? The road blocked off? Three years later, Joanne, musician, her walking through the woods, blocked, the mysterious dogs? 6. Ian and Dianna, relationship, their love for their daughter? Concern about his absence? Plans to tell their daughter, her coping or not? 7. The dreams, dogs, the driving, the crash, death? Waking up, with Joanne in the kitchen? The return to bed? Dianna and her similar dreams, fears? 8. Ian going on his journey, ringing Dianna, leaving his watch, the return? The beginning of the fulfilment of the dream - the truck with the dogs, the brakes failing, his crashing, trying to save himself, going over the cliff, caught in the tree, the premonition of the seatbelt, his gradually letting it go, crash and death? Diana and her premonitions, the phone calls, cut off, sense of death? 10. The finale with Joanne communicating with the dogs - the power of evil, her malice, the death of her father? 11. How clear was the plot, the characterisation, themes? Satisfying movie or puzzle?